Gorgeous off-shoulder medieval style Dress with flower hair Wreath. Perfect for an Old England Medieval look or film themes! This two piece outfit includes green dress and flower headpiece. The green dress has a gorgeous floaty design, with gold detailing, as pictured. The middle section of the dress is a sumptuous velour material, with green netting for the rest of the design to create the flowing style. The flower hair wreath has pink and white flowers, with green leaves, on a rigid wire wreath. 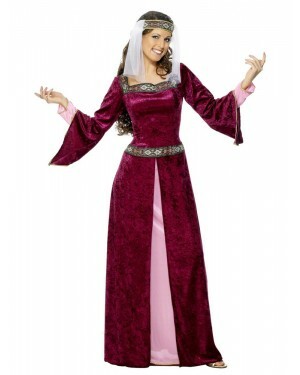 This fair maiden outfit is perfect for medieval, film themes or any fancy dress occasion. The costume is available in sizes Small and Medium. Please note that the shoes are not included.